WASHINGTON -- FBI Director James Comey has told top FBI officials that President Trump asked him to stay on as head of the bureau. Comey told the officials on a conference call in recent days. Asked about the report Tuesday by ABC News, Trump had no comment. The White House has not responded to ABC News' inquiries about the news. 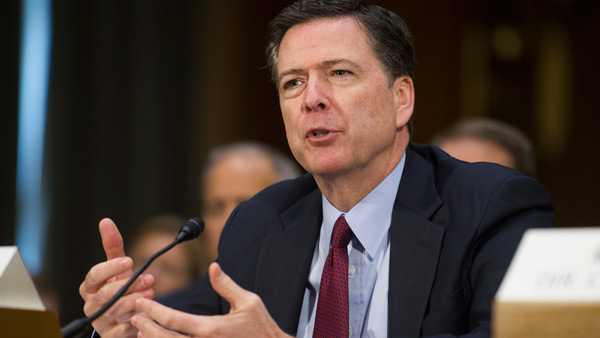 Comey was appointed by President Obama in 2013 for a 10-year term, but his future at the FBI came into question after his handling of the FBI probe into former Secretary of State Hillary Clinton's email server. On July 5, 2016, Comey held a news conference, announcing that the FBI was recommending no charges be filed against Clinton. Although Comey called Clinton's actions "extremely careless," he said the FBI concluded there was no evidence that Clinton intended to violate laws. Trump, then the Republican presidential nominee running against Clinton, released a statement the same day calling the FBI's conclusions part of a "rigged system." "... Because of our rigged system that holds the American people to one standard and people like Hillary Clinton to another, it does not look like she will be facing the criminal charges that she deserves," Trump said in the statement, later tweeting that it was "unfair." Then at the end of October, with 11 days until Election Day, Comey sent a letter to Congress informing them that the FBI had learned of the "existence of emails that appear to be pertinent to the investigation" into Clinton's email server. The new emails had been discovered through a separate FBI investigation into former New York Congressman Anthony Weiner. The emails came from Weiner's now estranged wife, Huma Abedin, who is one of Clinton's closest aides and worked in the State Department under Clinton. Trump and his supporters praised Comey's decision to announce the new email review, while Democrats were flabbergasted. Comey's letter was viewed by leaders in the Justice Department as a break in a longstanding tradition of avoiding actions that could potentially influence an election's outcome. On Nov. 6, 2016, Comey wrote a second letter to Congress, alerting them that the review of the newly discovered emails was complete and the FBI found nothing criminal that would change its July conclusion that Clinton shouldn't be charged. With the FBI now clearing Clinton a second time, Trump criticized Comey and the FBI again. "It's a totally rigged system," Trump said a campaign rally in Michigan. After Clinton lost to Trump in the election, the Democrat said she believed Comey's announcement of the email review 11 days before the election was a turning point in the race. The Justice Department inspector general has opened an investigation into Comey and the FBI's handling of the Clinton email investigation. The probe will look at whether Comey failed to comply with department "policies and procedures" by publicly releasing details of the Clinton case and announcing that the investigation was being reopened so close to a presidential election. On Sunday, President Trump and Comey embraced before cameras during a White House reception to honor law enforcement leaders. "He's become more famous than me," Trump said as he singled out Comey for recognition. ABC News' Mike Levine, Josh Margolin and Jonathan Karl contributed to this report.